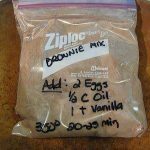 Never buy boxed brownie mix again! 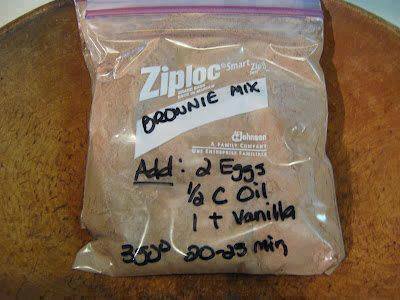 Follow the recipe below and make brownies for approximately 30 people with each mix! Put dry ingredients in plastic ziploc bags or mason jars. At Baking Time Add: Eggs, Vegetable Oil, and Vanilla. Bake @ 350 degrees for 20-25 minutes in an 8x8 or 9x9 pan. Check after 12-15 minutes of baking and remove when brownies are done! What size ziploc bag should be used? ?